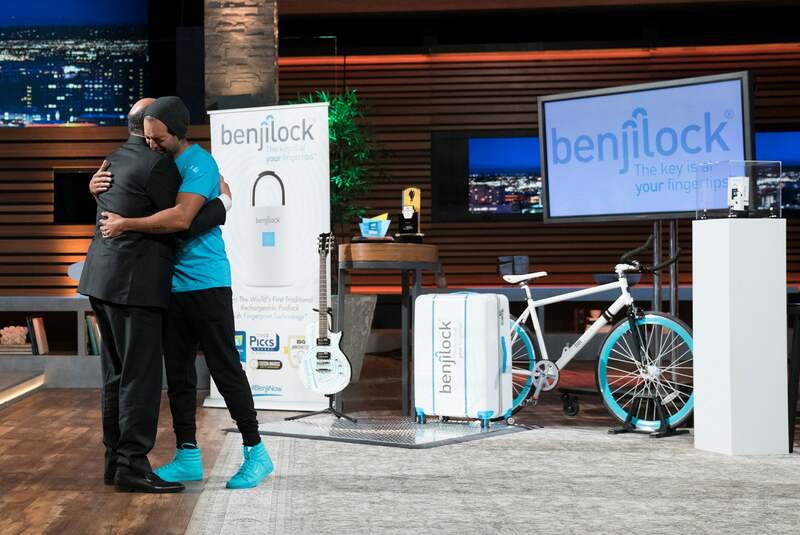 Robbie Cabral was able to lock down a $200,000 investment for his company, BenjiLock. In a tear-jerking final segment on a recent episode of Shark Tank, Robbie Cabral accepted a $200,000 investment for 15 percent equity of his company from Kevin O'Leary. The emotional moment marked the culmination of Cabral's inspiring path from a penniless immigrant student, working janitorial jobs just to scrape by, to full-fledged CEO of a well-funded startup. "It's an incredible feeling," he tells Entrepreneur. "When you come from the bottom and then go up, you kind of appreciate the journey more." Entrepreneur asked him to share some of his lessons over the past few years. Cabral came to L.A. from the Dominican Republic with dreams of being a rock musician. But after a few brutal months banging on club doors, the cold hard reality of life in the music business set in. His friends packed up and went home, but Cabral decided to stay. "I love my country, but I just felt like there was really not a lot of opportunity to move forward," he says. "I needed to figure out a way how to stay here and be proactive." So he banged on some other, less glamourous, doors. "I did a lot of crappy jobs. Dishwashing in restaurants, cleaning vomit in hotel rooms, doing people's laundry, cleaning up gym locker rooms," he says. "I had a BA from college and I was doing this." There were many days when he felt like quitting, but a voice in his head kept telling him, "This is not the end of your journey. This is going to lead to something else, keep pushing forward, always stay positive," he says. "Even though that was hard, the positive energy really helped me." Eventually, Cabral was able to cobble together enough money to pay for a management course at UCLA. Learn to live with rejection. Even with his newfound credentials and connections, Cabral couldn't land a decent job. "I just started applying to lots of jobs, and nothing came in," he says. "It was always that rejection." A lot of it was cultural, Cabral claims. "When you come from another place, even to draft an email, I had to ask my wife to help me out," he says. "But you kind of have to learn and grasp, and each interview I did, I learned more." One thing he learned was to always be on time. "[Here,] when they tell you we're going to speak at 10 a.m., 10 a.m. is the call. Back home, I'd probably expect your call at 1 p.m," he says. Following up was also essential. "You need to follow up after a job interview regardless if you get the job or not," Cabral says. "It shows that you are passionate and really want to pursue that aspiration, especially in my case where everyone was looking for a talent who was more specific for their needs." Eventually, Cabral began to land some jobs, including a well-paying position at a real estate company. Unfortunately, for reasons he still doesn't entirely understand, he was let go during the Christmas holidays -- two weeks before his baby boy was born. The news was devastating, but rather than get angry, he got a former co-worker a promotion. "I told them that this has been a positive experience for me, but I just wanted to recommend one thing: To give a young kid on my team a full-time job," he says. "Because he's been working here part time and I don't think you guys appreciate him enough." The kid got the job. With no job, no prospects and a new baby keeping him up all night, Cabral hit an all-time low. "Part of me felt like I want to go back home. I'm done with this whole American Dream crap," he says. He became depressed and gained 50 pounds -- which, strangely, turned out to be a good thing because it led to him joining a gym. "That's where the whole BenjiLock idea started because I noticed people having issues with their combination, locking their keys inside the locker, getting stuff stolen all the time," Cabral says. "One guy had a Bluetooth lock but couldn't get a Wi-Fi connection. So I thought, what if I designed a simple lock that you can open with your fingerprints, but also with a traditional key?" The good news: After doing research, he discovered there was no product like this in the marketplace. The bad news: Cabral had zero tech experience. Luckily, he was able to find a local engineer to buy into his vision, and he agreed to build the lock on his off-time. For three years, Cabral scraped together enough money to keep his dream alive, even though his family and friends told him he needed to get a real job. "That kind of inspired me more," Cabral says. "I was like, I'm just going to take all this in and I’ll be the last one laughing." Last year, a friend suggested that Cabral showcase his invention at the Consumer Electronics Show (CES) in Las Vegas, an idea which he initially dismissed. "I wasn't selling," he says. "All I had was a protype." But realizing he needed to make a big move to jumpstart his business, he decided to go for it. It was the best decision he ever made. Crowds gathered around his booth, and he was named a CES 2017 Innovation Award Honoree. In addition, people kept encouraging him to audition for Shark Tank, which was doing an open casting call at the convention. "I'd never even heard of the show," Cabral says. "But I ran over to their booth at the last minute. I was one of the last people on the line." After his audition, he was told, "There's something here. I can't promise you anything, but I'll be in touch," according to Cabral. Back in L.A., Cabral was asked to pitch Shark Tank's producers numerous times. The same guy who couldn't get an employer to even return his calls three years ago was ulimately selected to be one of 50,000 applicants to appear on the show. After he poured his heart and soul into his pitch, Cabral was faced with a dizzying array of different deal options. Many expected him to team with fellow Dominican-American Alex Rodriguez. Lori Geiner, with her QVC expertise, also seemed like a good fit. But in the end, Cabral went with Mr. Wonderful, Kevin O'Leary. "I went with my gut, and my gut kept telling me to go with Kevin," he says. "He was asking all the right questions. He just connected with me." This was the same gut check he's used to keep him on track all these years. "Even though I had to do all those crappy jobs," he says, "I always followed my gut, followed my passions and just kept pushing."